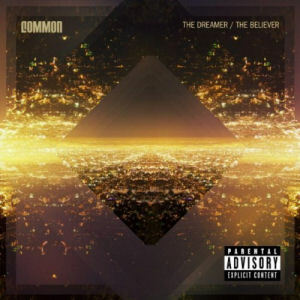 RapReviews.com Feature for January 31, 2012 - Common's "The Dreamer/The Believer"
It would be the height of dishonesty if I didn't tell you from the jump that Lonnie Rashid Lynn Jr. b/k/a Common is one of my favorite artists out of the last 30 years. He's on a short list of hip-hop artists I respect the most, not just for making timeless musical classics, but for espousing an artistic and spiritual philosophy I connect with on a deeply personal level. On a short list of the most important concerts I've ever been to, seeing Common perform at The Metro in Chicago is either #1 or #2. Whenever people make those "if you have to be stranded on a desert island" lists and only a few albums can make the cut, I always include "Resurrection" and "Finding Forever" usually isn't far behind. He's got a 20 year track record of hitting me in the soul with his lyrical flow, vocal tone, and impeccable musical acumen. I'm to hip-hop what Obama is to politics" - Common, "Sweet"
And yet the truth is the very fact I'm a long time unapologetic fan of Common is why it didn't originally make sense for me to review "The Dreamer/The Believer." I know damn well that I'm biased about his music, though I think I've still been able to discern when Common albums aren't up to HIS standards (and "Electric Circus" immediately comes to mind). Nevertheless I put off reviewing this album for several weeks and solicited staffers for coverage, and was surprised that nobody took the offer. Perhaps nobody wanted to be in the position Jay Soul found himself in when he gave "Universal Mind Control" a harsh review. Some of the feedback was due to the unusual/experimental way he wrote it up, but even putting that aside it was hard to ignore a 4.5 for beats and 6.5 for rhymes. Yeah that's the thread that helps us move ahead" - Common, "Cloth"
Even if Lonnie's fans were as upset as I was, there's no denying that Jay Soul was true to himself in his assessment, and entitled to his opinion even if it was unpopular. Criticism isn't a popularity contest, so if you don't occasionally ruffle feathers, you're probably not doing your job. I value Jay Soul's perspective and insight highly, even if we occasionally agree to disagree on how we rate a CD, because a diversity of thought is always preferable to either becoming a clone or joining a group of them. And with a few years to think about it, while I wouldn't have scored "Universal Mind Control" that low, it's far from the most played of his albums in my collection. I think Jay Soul was right that Common seemed to have lost focus on his rap career as he got wrapped up in the world of acting and politics. It happens. Will Smith and O'Shea Jackson know. Still opening roads for Omoye and Amina" - Common, "The Dreamer"
Perhaps that's the reason I feared reviewing "The Dreamer/The Believer" the most. Jay Soul clearly found "Universal Mind Control" disappointing, and I didn't want to be the one to give Common a second unflattering review in a row if he missed the mark again. It's so easy as a writer to consider and reconsider your own intentions to the point you paint yourself into the corner often called "writer's block." You don't want to be too favorable and praise somebody you already like if they don't deserve it, but you also don't want to overcompensate and be too harsh because you're afraid that if you say anything nice you'll come off like a fan and not a critic. That's why I opened this review by telling you Common is one of my all-time favorites, and after 30+ years of listening to rap music that distinction is not a small one. Even if he makes a misstep here or there, I roll with the punches. If he released several bad albums in a row I'd probably start to lose faith, but in two decades that hasn't happened yet. Ali MC, I fight for more than the title, your idol" - Common, "Gold"
Like "Resurrection," an album which has universal acclaim far and wide beyond any one writer's opinion, "The Dreamer/The Believer" is produced by fellow Chicago native No I.D. While that album had a few minor contributions from Ynot, this one is a one emcee/one maestro affair. In fact that's a fairly good use of the slash in correlation with the album's title. Common is "The Dreamer," the ever hopeful artist who faced hard times growing up in Southside Chicago, yet never let his environment get in the way of his goals. No I.D. is "The Believer," a man who was happy to let Common go his own way in pursuit of his artistic goals, yet willing to get right back on board when Common came calling. Truly No I.D. believes in his talents, and the soulful beats of this album show it. From the heartfelt R&B samples of "Lovin' I Lost" to the subtle harmonies and drums of "The Believer" featuring John Legend to the slinky funk and city sirens of "Raw (How You Like It)" he strikes the right notes over and over again. Go to the bar to get around like a propeller" - Common, "Raw"
Common and No I.D. is one of those impeccably perfect combinations, the hip-hop equivalent of chocolate and peanut butter, only this one isn't going to make you fat if you have too much of it. At 50 minutes "The Dreamer/The Believer" doesn't seem too long because it's so easy to consume - another 20 minutes of this tandem would be just as pleasing. I don't imagine myself getting tired of songs like "Cloth" or "Window" any time soon, and yet I hear the fan in me talking and I'm forced to push it back and make a critical analysis. Here it is: if "Universal Mind Control" was not the Common you were waiting to hear, "The Dreamer/The Believer" is. This is the Common of old, and by collaborating with No I.D., everything old is now brand new. This isn't an album of 1990's styles brought to 2012 - these are contemporary beats and rhymes that can hang with anything else coming out on the scene. Common may have been drifting for a minute, but now that he's back in it, hip-hop has a much needed voice back.